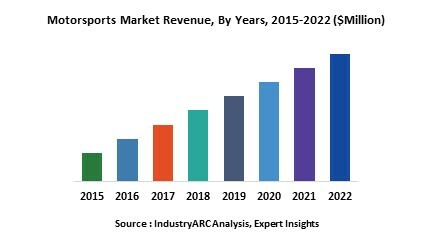 The global motorsports market was valued at $4.3billion in 2017 with revenues accumulated from different various segments such as advertising, sponsorship, merchandising, ticketing, broadcasting and hosting fees. The market is expected to grow at a CAGR of 8.43% during the forecast period 2018-2023. NASCAR and IndyCar are the two major series in the motorsports racing. In 2017, NASCAR racing annual revenue was $2973.30million and is estimated to grow at a CAGR of 1.90% during the forecast period. IndyCar racing annual revenue for 2017 was $192.1million and is estimated to grow at a CAGR of 6.41% from 2018-2023. Total market value of NASCAR and IndyCar was $3164.50 million in 2017 and is estimated to grow at a CAGR of 2.8% throughout the forecast period. Motorsports are globally held competitive events which use highly optimized and customized motor vehicles for racing competition. There are different types of motor vehicles which are used in these competitions such as bikes, cars, go-karts, boats, trucks and snowmobiles and more. The most popular of these include cars and are usually called auto racing or automobile racing. Auto racing is currently seen in different series such as Formula One, IndyCar, GP2 series, Formula V6 Asia, Formula Three, F2, Formula Palmer Audi, Formula Atlantic and so on which are classified under Formula racing. Other types of racing include touring car racing such as V8 Supercars; sports car racing like GT1, GT2, GT3, Le Mans; stock car racing such as NASCAR; British Rally Championship, Monte Carlo Rally and so on. Ferrari SPA has introduced the new Ferrari SF71H to compete in the Formula 1 World Championship. Introduction of the latest rule changes in the last season has led to the manufacturing of significant aerodynamics and wider tyres, aimed at achieving high performance. As compared to the previous model the wheelbase and cooling system has been changed slightly with the revised dimensions. The introduction of the new Halo designed to protect the cockpit area is the latest modification done by the company. It weighs around 15 pounds along with fittings. The event organizers and venues across the world are on a constant pursuit to enhance the spectator experience at sport events by adding entertaining elements such as fan zones, concerts and adding more scope for star performers. The US Grand Prix and NASCAR’s pre-race concerts conducted every year add value for fans, generate additional coverage and offer additional activation opportunities for partners. Apart from Facebook, Twitter, Snapchat and Instagram, the virtual reality of motorsports has emerged over a period of time to connect and engage with fans. In the recent times, Formula One has delivered its first Facebook Live broadcast at the Abu Dhabi Grand Prix, while the McLaren Live app delivers fans content, including on-car telemetry, direct from the garage during Grands Prix. Formula One's new owners have relaxed restrictions on teams posting video on social media during February's pre-season testing in Spain. Who are the Major Players in Motorsports market? The companies referred to in the market research report includes Bridgestone Corporation, Ferrari S.P.A., Force India F1, Mercedes AMG PETRONAS F1, Michelin Tyres PLC, MRF Limited, Pirelli & C. S.p.A., SAUBER F1 and more than 25 companies. Figure 20. Company’s Sales By Region For The Year 2013.